The MV Galleons Passage arriving at Damex Shipyard, Santiago de Cuba, Cuba on May 26, 2018 to being planned retrofitting works. Yet more delays in the arrival of the MV Galleons Passage – a catamaran passenger ferry bought by Government to service the inter-island seabridge. 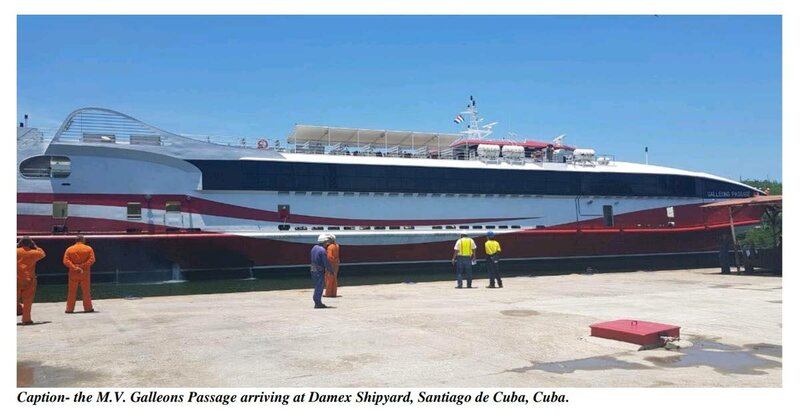 Although it arrived as scheduled at the Damex Shipyard in Santiago de Cuba, Cuba on May 26, the retrofitting works have not yet started on the vessel because of certain delays. However a setback was experienced, NIDCO explained, “arising from delays in the completion of designs and the consequential issue of approved drawings by the seller.” As such, the shipyard “is also experiencing delays” in procuring the requisite materials. Reply to "NIDCO: MV Galleons Passage still in Cuba due to delays in retrofitting works"